Product prices and availability are accurate as of 2019-04-18 15:56:04 EDT and are subject to change. Any price and availability information displayed on http://www.amazon.com/ at the time of purchase will apply to the purchase of this product. 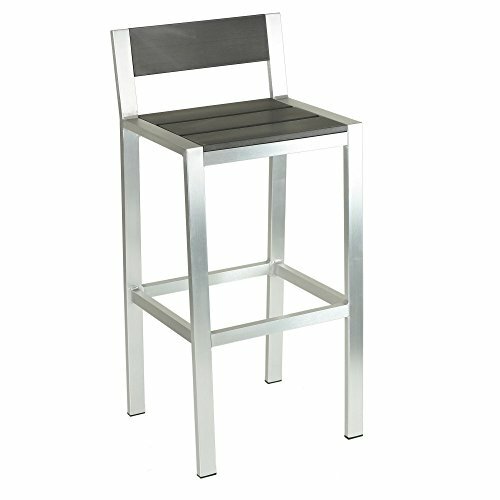 Provide additional outdoor seating in style with the Cortesi Home Haven Aluminum Outdoor Barstool. The durable aluminum and polywood construction of this barstool ensures lasting use year round. HDPE does not absorb moisture and will not rot, making this barstool a perfect accessory indoors and outdoors. Its chic, contemporary design features a brushed nickel finished frame and a slate gray vinyl top. This handy seat requires no staining or waterproofing upkeep, making it resistant to stains and other environmental elements. Cleaning is super easy with just a little soap and water. Dimensions: 17W x 14D x 37H in.. Constructed of aluminum, polywood, and vinyl. Finished in brushed nickel and slate gray. HDPE does not absorb moisture and will not rot. Requires no staining/waterproofing upkeep. Chic, contemporary design. Resistant to stains and the elements. Clean with soap and water.